song, dance and functional art once displayed this. Of course Indigenous cultures around the world, from the Cherokee to the Celts, knew how to identify plants and their medicinal use. 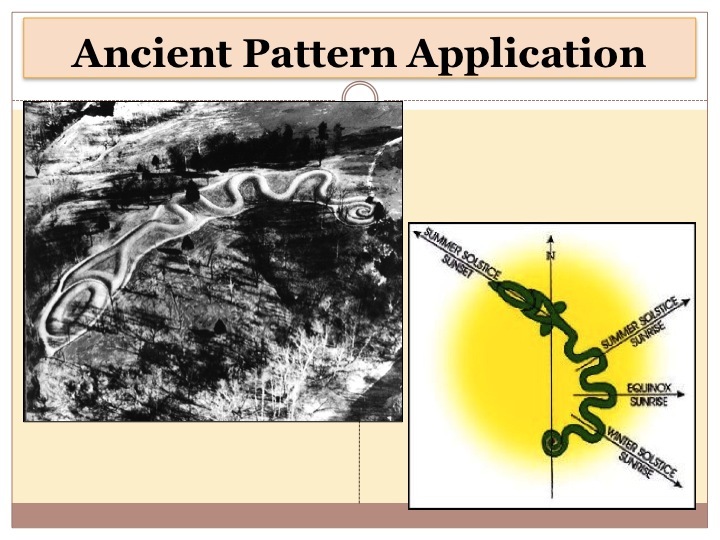 This is a form of material knowledge but the pattern behind where to find them or when to harvest them for maximum potency was based on solar/ lunar rhythms which was a form of pattern understanding and its crucial application. Thus below we examine one pattern application from the mound building cultures of Southeast Ohio, USA. An impressive earthwork at a quarter mile length (400 m), it is comparable to stonehenge or Notre Dame in its architectural marvel. It combines three patterns that we examine further in this chapter, the egg, the sinuous shape, and the spiral. It tells a story for sure, it may have been a water harvesting device, and it was for sure a solar/ lunar calendar. Furthermore, it is inspirational and its ability to survive the plow from the European Colonists is remarkable. Built nearly 2000 years ago in Southeast Ohio on a ridge top, this earthwork is still well preserved although some of its contents were mined by local and exploitive archeology. It is one of many effigy mounds in this area and not to far from their capitol that was once called “Mound City” and became the Ohio capitol at one time called Chillicothe. It is believed that this culture was highly sophisticated and their crafts and artifacts show this through extensive trade routes. The art itself is full of patterns and its meaning is only to be pondered and interpreted. nature of life and death. The serpent and this sinuous shape it takes on is a ubiquitous shape in many cultures. Take Hermes staff and its form in modern medicine symbology with most likely it being a representation of our DNA. Or how about the Kundalini in eastern tradition and its rising energy? How about the Mayan spiritual prophecy of the snake being your terrestrial body but the eagle being a representative of transcending this physical world in to a higher spiritual development (Mexican flag still carries this). And why there? Well its been documented that below the mound is within a rare geologic feature through a meteor crater impact leaving behind a special stone and underlying geology. Did they know this and was it built there to magnify its purpose? Its fun to hypothesize and dream of the past but it is easily grounded through pattern application. Bill Mollison spoke widely in the patterns chapter on how indigenous people used this tradition of patterns with just about everything from navigation to planting, to education and spirituality. It is through developing the pattern eye that our cultural revolution will be driven.